Why You Need A Bullet Proof Personal Brand! I went Live on Facebook and Instagram. Here's a clip of the discussion. Have you ever felt that no matter what you do, you just aren't good enough? Do you sometimes question whether or not you have any skills or abilities to offer to the world? Feeling unsure about ourselves and doubting whether or not we can add value to the world is more common than you may think. Self confidence is a real struggle for many professionals. What I have discovered about personal growth is, it is difficult to move upward when your environment or surroundings pull you down. Yes, being internally motivated is important yet there is still something to be said about the company that we keep. Not only are our social contacts influential in how successful we ultimately become, but many times our work environments can actually slow down our progress. In the 15 Invaluable Laws of Growth, John C. Maxwell shares that to growth thrives in conducive environments. If you are surrounded by people who are growth oriented and are in environments that enable you to work to your strengths, you stand a greater chance of excelling in whatever you choose to do. 1. Everyone around you seems to be going NOWHERE FAST! This is a good sign that, if you are in fact focused on growth, you should strap up your sneakers and run for the border. 2. You feel stunted or imprisoned when you are at work and you can't figure out why. A quote I read along time ago said this "Everybody is a Genius. But if you judge a fish by its ability to climb a tree, it will live its whole life believing it is stupid." If you are in a toxic environment or are not able to do work that is meaningful to you, you may be that little fish trying to climb the tree. Find your strength zone and work in it. If your work environment leaves you feeling confused or lacking, it may be time to assess if you are in the right place. 3. You lose interest in the conversations and activities that you used to get excited about. There could be many reasons why we lose interest in the things we used to like, but chances are if the environment that we are in leaves us constantly feeling bad, bored, sad or worse confused...it's probably time to check out. Have you ever felt that your environment was keeping you back? Was it the people or the places? What did you do to make your environment work for you or did you just exit all together? Feel free to share below. Would love to hear your thoughts. Want more tips on how you can grow to your fullest potential? Get on the VIP list to get more tips on how you can develop a Captivating Personal and/or Business Brand. You will get first access to my resource library for paid and unpaid products, discounts to newly launched products, freebies (books, templates or guides) that will help you as you build your own personal and business brand. Are you prepared to face yourself? That dreaded little piece of reflective equipment. I remember there was a time when I used to absolutely dislike looking in the mirror (literally and figuratively). There was this thing happening with my self-esteem that just would not allow me to feel comfortable looking back at myself. A lot of it stemmed from the fact that I felt very 'unpretty' , but also because I just didn't like who I thought I was. That was a period where I can honestly say I did not value myself. I was young, uncertain of my identity, confused about my purpose. I assessed my value based on what I assumed others thought about me. Fundamentally, I was lost. Have you ever felt a strong dislike toward yourself? Maybe because of something physical or maybe more to do with something that you did or maybe because of who someone else told you that you were/are? Well, can I tell you something? It's normal for us to go through periods of low self esteem. It's a part of getting to know who we are. What keeps us stuck though is when we are unable to see our worth entirely. When our self esteem remains low and we are unable to see value in who are are. For me, getting unstuck was really about discovering my overall beauty and learning not to judge myself by my past mistakes. When I was able to do that, I invited morning sessions where I would just stare in the mirror...just because. I was ok with interacting with people because I knew my worth. I no longer feared 'what are they going to say about me'. That became irrelevant. When that happened, I was able to focus on my growth both personally and professionally. In the 15 Invaluable Laws of Growth, John Maxwell shares with us that many people fail to reach their full potential because of low self-esteem. I have also found this to be true throughout my journey. The people that are the most successful are those who have a firm confidence in who they are and what they are all about. Whether your mirror is physical or mental, are you able to face it? Are you able to look back at what is being presented to you and say that you are alright with the reflection? If not, how can you work on building your self-esteem so that you are in a position to really appreciate and value all that you are and can potentially be? You are worth the effort, time and energy needed to develop yourself. If you see value in yourself, you will add value to yourself. Are you ready to try something new? To grow beyond your wildest imagination? Take an intentional step in the direction of your personal growth. Join me and select group of like minded professionals as we explore John Maxwell’s 15 Invaluable Laws of Growth. 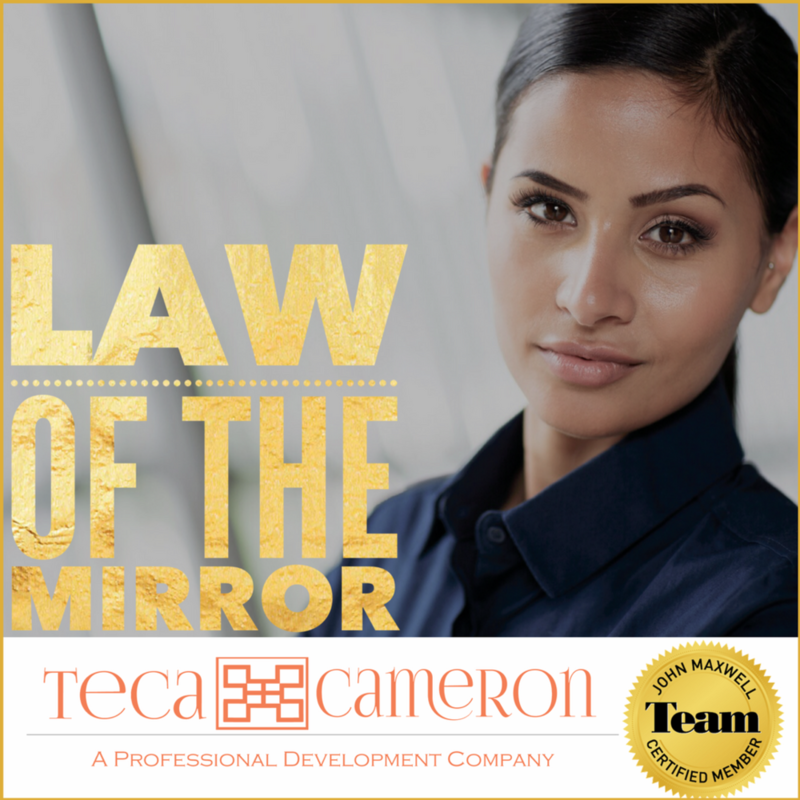 Teca Cameron-Tackie is a leadership and success coach. She works with emerging leaders, mid-career professionals and entrepreneurs. She equips her clients to gain the confidence needed to WIN at life, work or business. She specializes in soft skills development specifically coaching her clients to build their most captivating personal brands by learning how to master their appearance, behaviour and communication for success.